This Kunzite and Diamond Cocktail Ring in 14K White Gold perfectly pairs a bold, simply sophisticated style with a demure, ladylike gemstone, creating a piece that makes a confident statement without screaming for attention. With a subtly-colored centerpiece and over a third carat of diamond accents, this is a ring with glittering elegance. 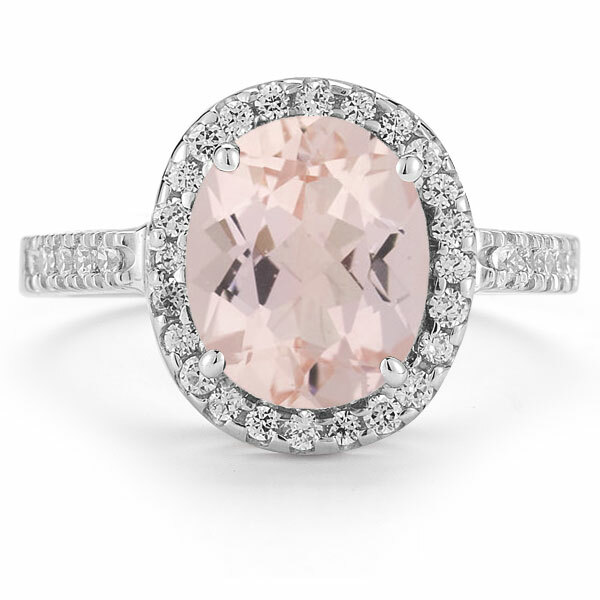 A sizeable oval-shaped kunzite is the focal point of this feminine and classy ring. This gem was discovered in California in the early 20th century, making it a relative newcomer to the jewelry scene. A member of the spodumen family, this pale pink gem has just a hint of violet (the result of the presence of magnesium) and a soft sparkle that gives it a good measure of feminine charm. At 10mm high and 8mm wide, this kunzite is large enough to be daring despite its sweet shade. Forming a frame around this kunzite are 24 small round diamonds that surround it with colorless glitter. On either side of this center gem are five additional diamonds that glimmer as they peer upward from the shining band for a grand total of 34 accent stones. The 14K white gold that forms the foundation of this ring provides a cool backdrop for this unique statement piece. 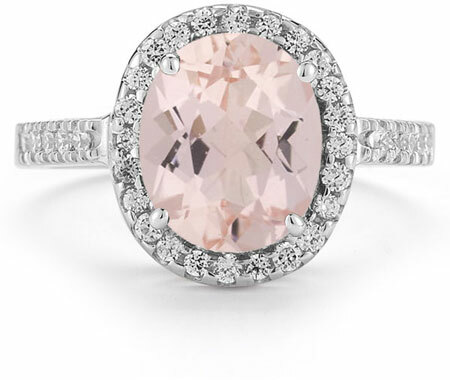 We guarantee our Kunzite and Diamond Cocktail Ring in 14K White Gold to be high quality, authentic jewelry, as described above.